Harley-Davidson Motor Company is an American motorcycle manufacturer based in Milwaukee, Wisconsin. The company sells heavyweight (over 750 cc) motorcycles designed for cruising on the highway. Harley-Davidson motorcycles (popularly known as "Harleys") have a distinctive design and exhaust note. They are especially noted for the tradition of heavy customization that gave rise to the chopper-style of motorcycle. Harley-Davidson also supplies many American police forces with their motorcycle fleets. 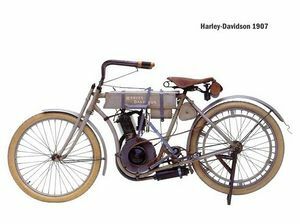 HD considers 1903 to be its year of founding, though the Harley-Davidson enterprise could be considered to have started in 1901 when 21-year-old William S. Harley drew up plans for a small engine that displaced 7.07 cubic inches (116 cc) and had four-inch flywheels. The engine was designed for use in a regular pedal-bicycle frame. In 1903 Bill Harley and Arthur Walter Davidson built a one-cylinder motorcycle. This motorcycle was well built and they ended up selling it. They were now in the motorcycle business. They continued to build motorcycles and by 1908 they had built 154. Around this time William Davidson joined the company and it wasn't long before they had 20 employees and a new factory. In 1909 Bill Harley took on a project to built a V Twin engine. It turned out to be a 1000 cubic centimeter, 45 degree V twin engine producing seven horse power. This 45 degree V twin became one of the most recognizable symbols of the Harley-Davidson. The bar and shield logo came in 1910 and is still with them today. The F Head engine was introduced in 1911 and was the main power plant until 1929 when it was replaced by the flat head engine. By 1912 Harley-Davidson was ready to expand again into a new 6 story plant. At this time they also started exporting. From 1914 to the 1920's there was much advancement, such as the addition of a sidecar, the three-speed sliding-gear transmission, and the change in styling, which looked more like the motorcycles of today. In 1928 the first twin-cam engine and front wheel brakes were available. This enabled the motorcycle to reach speeds of more then 85 mph. The 1930's saw Harley-Davidson break more speed records. In 1932 the three-wheel Servi-Car was introduced which would become a common police and commercial vehicle. In 1936 the Knucklehead was launched and the Panhead followed in 1947. This machine made the Harley-Davidson American's motorcycle of choice. During World War II the Harley took an active roll. Civilian production was just about suspended and all efforts were concentrated on war production. Once the war was over in 1945 civilian production commenced again. In 1949 the Hydra-Glide was introduced using hydraulic front forks. The 1950’s were not a good time at Harley-Davidson. The British with their Triumph and BSA motorcycles had 40% of the market. These were smaller, lighter and in some cases faster bikes. This problem was met head on and in 1957 with the introduction of the Sportster. The English stayed on the scene until the Japanese bikes hit the market in the early 60’s. They were small, under powered but cute and did a lot to bring motorcycle to the attention of the general public. However they didn't stay small and cute very long. Companies like Honda, Kawasaki and Suzuki learned real fast and made some real fast motorcycles. Harley was almost put under at this time but they fought back. In 1969 Harley Davidson merged with American Machine and Foundry Company. This merger gave them needed cash but produced some poorly built bikes and Harley’s reputation suffered greatly. Harley-Davidson did survive and in 1971 the "Cruiser" was born. It was a sporty looking bike with the frame and power train of the FL series. This motorcycle was a great success and enabled Harley-Davidson to move to a 400,000 square foot plant in York, Pennsylvania. The 1970's saw Harley win a great many races including four consecutive years of winning the AMA Grand National Championships in dirt track racing. This page was last edited on 24 August 2010, at 01:44.